During my workshops Management 3.0, I always include the module Motivation. Without motivation, nothing would be produced. If you people would not be motivated to take care of older adults, build houses, transport goods, etc. the world would stop. 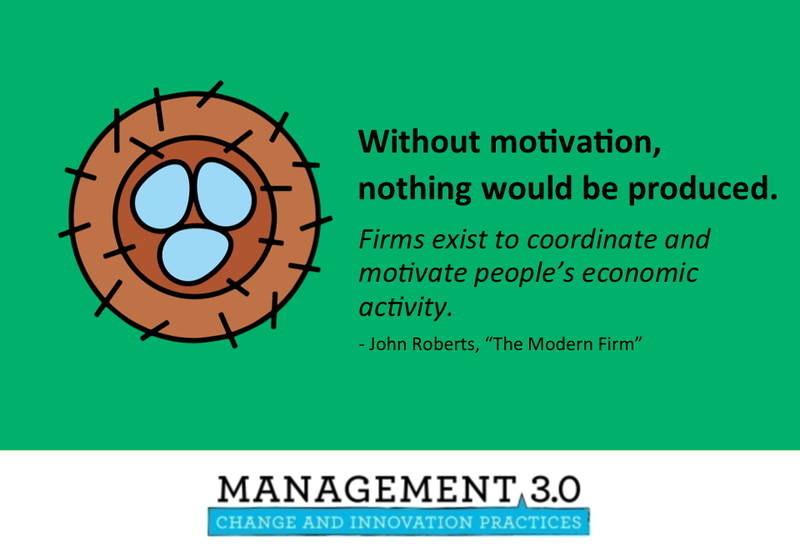 You can motivate people with intrinsic or extrinsic motivators. For example, I write blog posts because I like to write. Sharing my ideas, experiences, things I learned makes me feel good. An example of intrinsic motivation. I motivate myself for writing blog posts. There is also an extrinsic motivation in writing blog posts; it is marketing. It helps me to find new customers and also promotes my workshops. Some people are more motivated by extrinsic motivators; some people are more motivated by intrinsic motivators. Everyone is different. 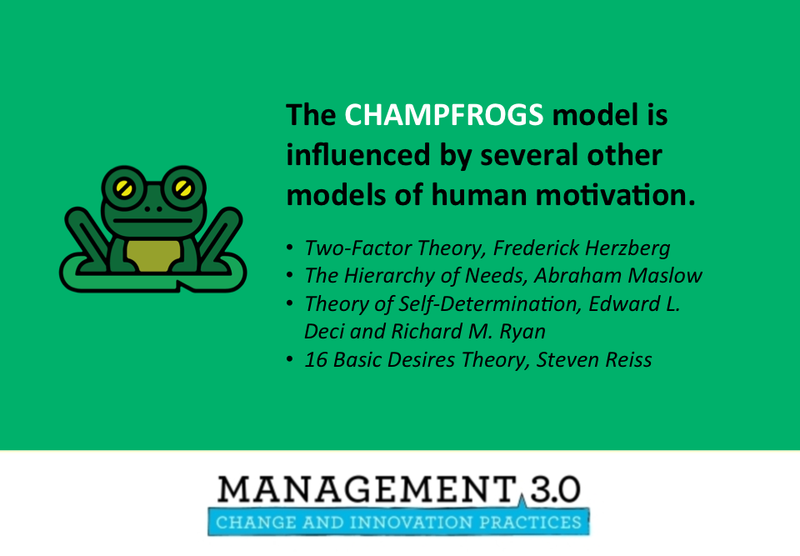 During the module Motivation, I always explain to people how they can use the Champfrogs model of Management 3.0 to learn about what motivates individuals. If you would like to learn more about this, just attend my workshop (An example of using my blog posts as marketing 😉 ). Management 3.0 is all about Managing the System. It is about creating an environment where people are feeling motivated, engaged, develop themselves and also keep improving things. You don’t manage people. Some of you, who attended my workshops, asked me the question: “Ralph, you talked about Managing the System, but now you are explaining how we can learn about individual motivators. Is that not managing people?”. Good question, and I not always had a clear answer to this question. However, in one of my last workshops, I realized what the answer to this question was! Sometimes things are simple, but for some reason, you don’t see it. Yes, the module Motivation is also about how to learn what motivates individuals. You can’t take the average, or summarize individual motivations to come to a conclusion. You can’t. You can’t build teams with what motivates people, motivators are always personal. The answer is simple, create an organization where people can fulfill their own motivators. Let’s take a look at the Champfrogs model in detail. Below you will find the ten motivators, in the second column, you will read activities, actions that you can take to give the people the opportunity to fulfill their personal motivators. Curiosity Organize Exploration Days. Organize Guilds/Community Of Practices. Let people select their own project. Innovation Challenges, ask all team members to solve some complex problems. Honor Introduce Kudo cards, where people can give compliments to each other. Organize a Work Exposition, give team members the opportunity to present what they did to other team members. Give team members the option to link their name to technology patterns that your company has. Acceptance Team building activities, like drinking beer to get people to know each other. Create Personal Maps and share the Maps. Have value sessions with the team, what is acceptable behavior in a team/organization. Mastery Some of the activities related to Curiosity are also applicable to Mastery. Let people select their own project for example. Provide accounts for PluralSights so people can learn if they want to. Provide slack time, accept as an organization that people are allowed to take up work outside their knowledge domain to learn. Power Have team members vote on new ideas, not just the manager decides what to do next. Give teams some slack time where they can work on their own initiatives. Use delegation board to empower teams. Freedom Flexible office hours but also working from anywhere. No dress code at work, except that you are not allowed to show up without clothes ;). Again let people decide on their own projects, but also how they do their work. Relatedness Organize outside working events, to give people the opportunity to strengthen social relations. Minimize the number of coffee machines so people have more opportunities to meet each other. Create areas where in your office where people can just hang out with colleagues. Provide excellent tools that really improve collaboration. Just to be clear, I am not talking about Skype for Business but tools like Sococo. Order Provide clear standards, provide clear policies and/or procedures. Have a Wiki in place where people can document the things that are relevant. Provide locations in the office where people can work alone now and then. Goal Have a clear purpose in your company, and also organize events where people can learn, share and connect to the purpose of the organization. Organize charity events where people can select the projects they would like to contribute too, helping cleaning up playgrounds, help elderly people, etc. Allow a team to select their own values, the values that important for them, they want them also to use at work. could work in your organization, have people select the team of the whatever time frame. Introduce a coaching program, team members can (voluntarily!) sign up to coach other team members. Start working with interns, this will give people the opportunity to coach also junior team members. Ask people to organize Guilds/Community Of Practices. Told you it is simple :). Organize different activities, related to all Champfrogs motivators in your organization. Your team members will link themselves to the activities they like, join projects or take the lead in some areas. If you have everything in place for all Motivators, you don’t need to manage the people anymore, you manage the system. What activities have you in place for the different motivators? Please share! Would you like to learn more about CHAMPFROGS? Discuss in a workshop how you can implement CHAMPFROGS in your organization? Attend a two-day Management 3.0 Foundation Workshop!